Once upon a time i was one of those that felt groundnut, tomato, pepper and a host of other ingredients was a horrible soup combination. Well, that was long before i tried it myself. Not only was i blown away, the whole family was blown away too by the wonderful taste. Regrettably, i just made a small pot that day and had to go under the pouring rain to the market to get ingredients for a whole new pot of soup the next day. 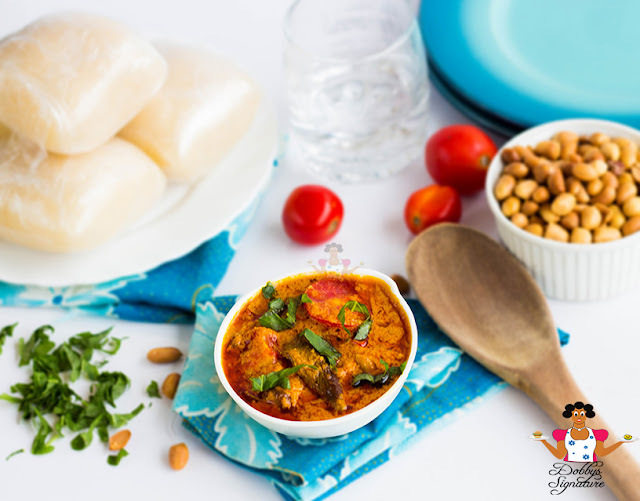 Groundnut soup is really popular especially in the Southern and Northern parts of Nigeria. 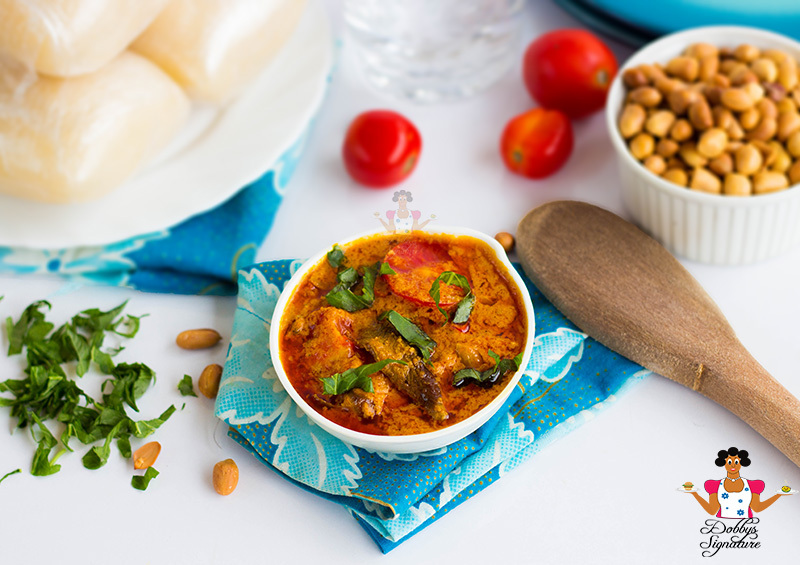 In ghana, groundnut soup is also known as Nkatenkwan where it's eaten with Banku and tilapia...Yum! If you haven't tried it before, you'd need to take my word on this one when i say it's finger licking gooooddd!!!. Apart from the taste, you stand to gain a whole lot from the health benefits of groundnuts listed below. • 2 Calabash Nutmeg "iwo/erhe"
• A handful of either washed bitter leaves, scent leaves or pumpkin leaves – chopped. Step 2: Wash the beef and assorted meat and place in an empty pot. Add crushed seasoning cubes, dried pepper, salt to taste and just enough water to cover the meat. Cook for about 25 minutes till tender. Soak the dry fish in hot water to soften, remove the bone and add to the cooked meat in the pot. Leave to cook for about 5 minutes more. Set this aside. 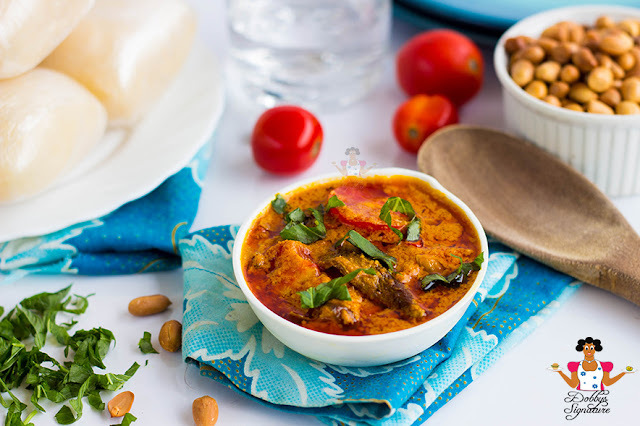 Step 3: Pour the roasted groundnuts into a blender, add water and into a smooth paste with a blender – Set this aside. Wash and blend the tomato and pepper into a smooth puree - Set this aside. Step 4: Pour the oil into a pot and pre-heat for about 2 minutes. Add the chopped onion and fry until translucent. Pour the groundnut paste into the pot, rinse the blender with a little water and also pour into the pot. Leave to cook for 10 minutes. Add the tomato & pepper puree, stir to mix then pour in the meat with stock . Add the crayfish and ground iwo, stir and leave to cook for about 10 minutes. Add the chopped vegetable and leave to simmer for 3 mins. Turn off the burner and serve with eba, pounded yam or any form of swallow. • Groundnuts contain a good amount of Folate which helps promote Fertility. • Groundnuts are an extremely high source of plant protein. This should be regularly incorporated in diet for children, vegetarians and protein deficient people. • Groundnuts contain a good level of monounsaturated and polyunsaturated fats that keep the heart healthy, thereby reducing the risk of coronary heart diseases. • Groundnuts are good sources of Tryptophan, an essential amino acid which is important for the production of serotonin, one of the key brain chemicals involved in mood regulation. Tryptophan also helps fight Depression by raising serotonin’s antidepressant effects when there is an increased amount of serotonin in the blood. Really yummy. I make this soup for people I'm trying to impress and my, do they love it. I make mine without the tomatoes though and I use the tiny black seeds used in peppersoup. That's true. Most people add mkpuru uziza (the tiny black seeds) also. Thanks for the contribution anon. Thanks for reminding me Shakeerah. Updated :) ! lol! that's hilarious. Not fair. I had tried this without the tomato puree. I added a few okra tho. Thanks Jocy. Do keep us posted. Nice one. can I use raw groundnut in place of roasted groundnut. You'd still have to roat the raw groundnut to give it the desired flavor required for the soup.